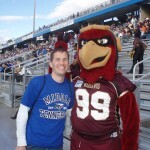 The game really did not mean much with both teams having six losses and a conference title far from reach. 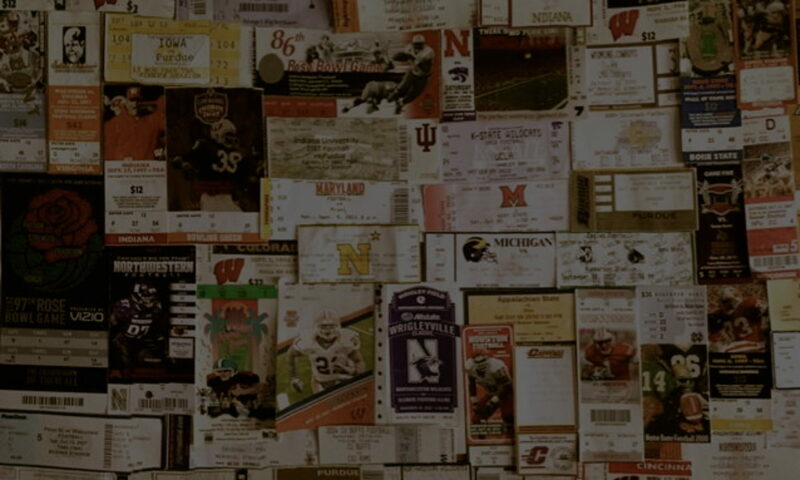 But, this is still football in the south and that southern flavor still lives even in the smallest of venues. 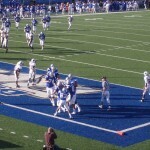 Upon arriving into Murfreesboro, we saw many passionate tailgaters not only grilling burgers and tossing footballs, but also dancin’ to some funk. There was a conga-line type group of dancers rollin’ out a soulful version of the electric slide. This wasn’t the north where the most soul you’d find would be at the bottom of your shoe. Really, these fans had it goin’ on. 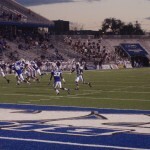 Raiders and Warhawks continue to fight as the sun sets away. 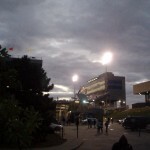 The lights from outside Floyd Stadium as the game rages on. 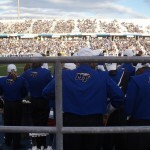 The band awaits its moment. 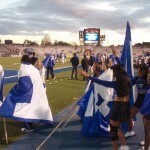 MTSU cheerleaders wrap themselves in the flags to keep warm. 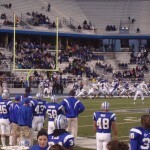 A big TD catch gets the Blue Raiders going. 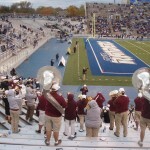 ULM brought their band and a few fans. 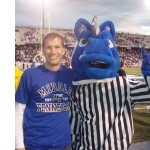 The Blue Raiders would take control. 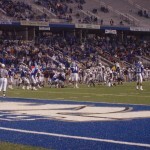 MTSU players look on as ULM closes the gap.